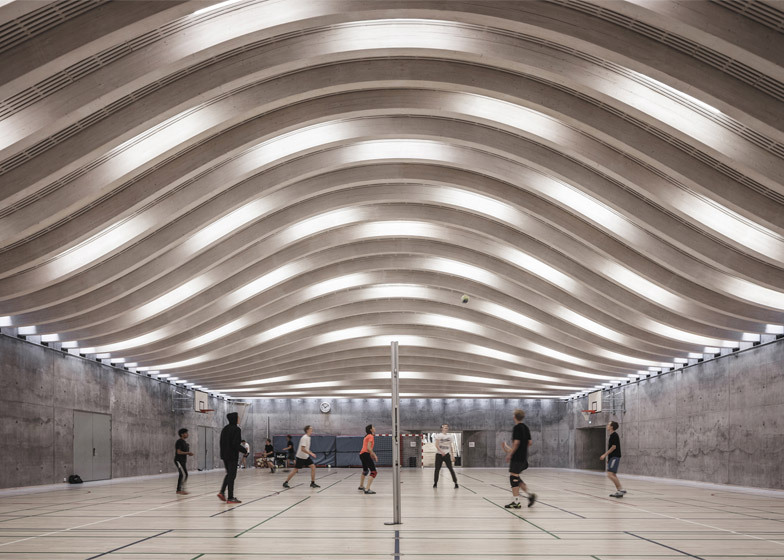 BIG has completed its second addition to a school in Denmark – an art school beneath a football field that joins the underground gymnasium with a humped courtyard on its roof (+ slideshow). 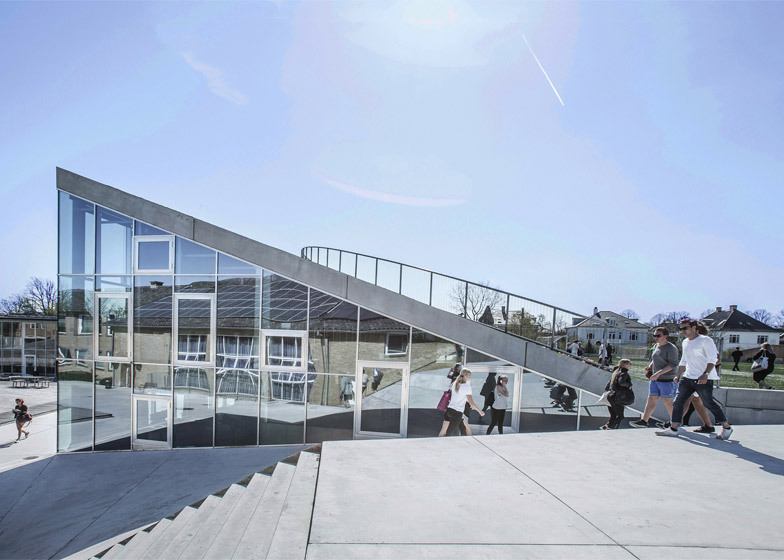 The firm led by Danish architect Bjarke Ingels was asked by Gammel Hellerup High School to add a series of new facilities to its campus in Hellerup, north of Copenhagen. 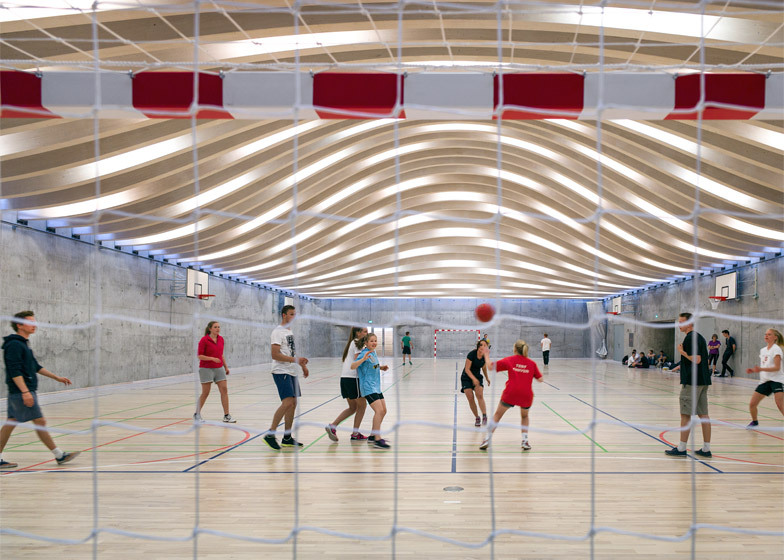 First up was the new sports hall, which was completed in 2013. 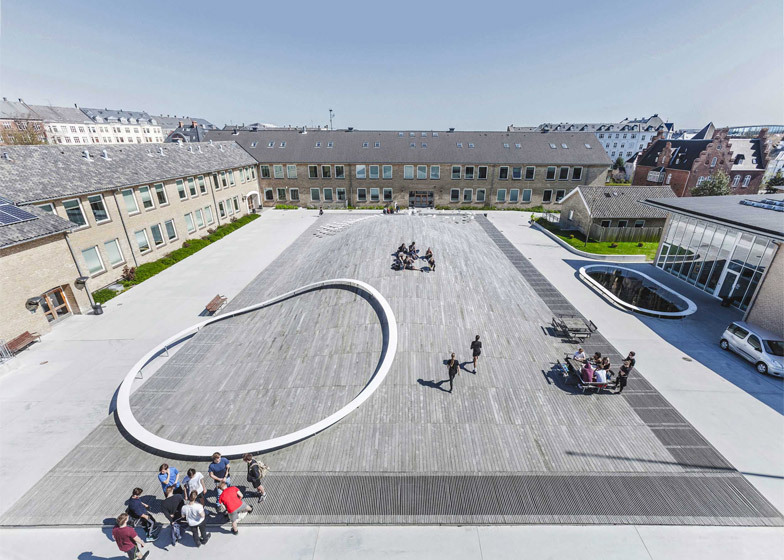 To keep it close to the existing classroom building, it was built in the school's courtyard and was sunken five metres below ground. 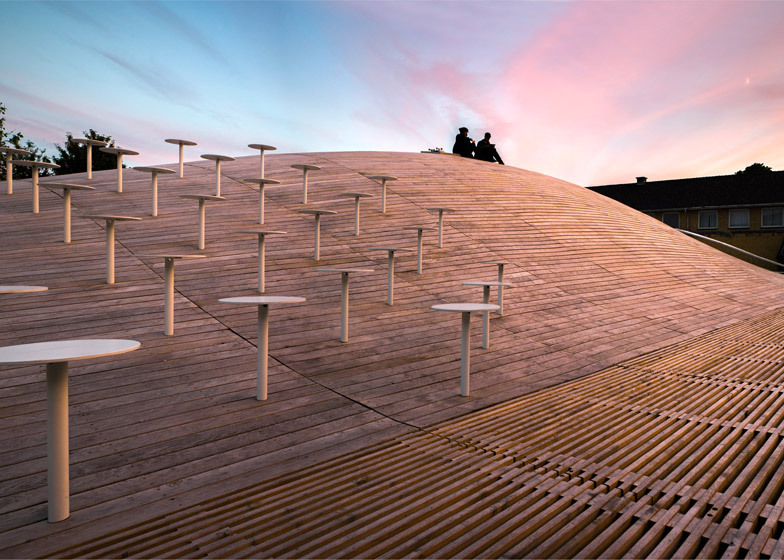 It was then topped by an arched roof to create a new humped terrain, ensuring that no outdoor space had to be sacrificed. 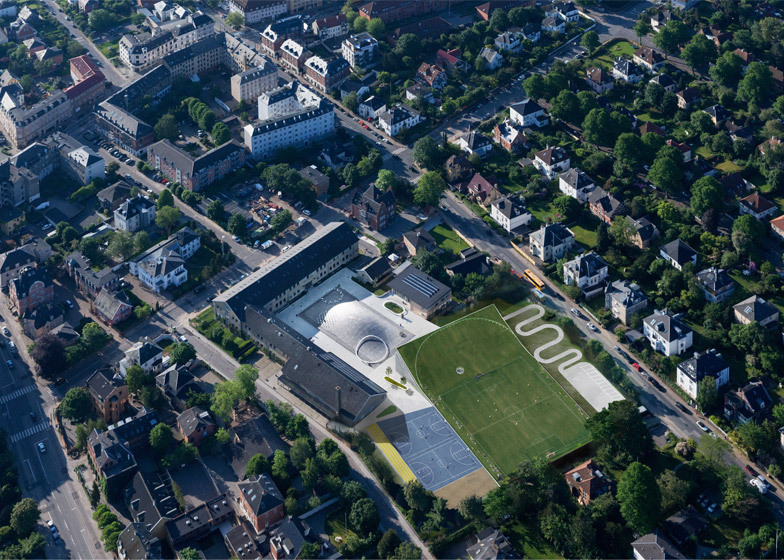 While this was still under construction, the team was asked to draw up plans for a second building – a new arts block. 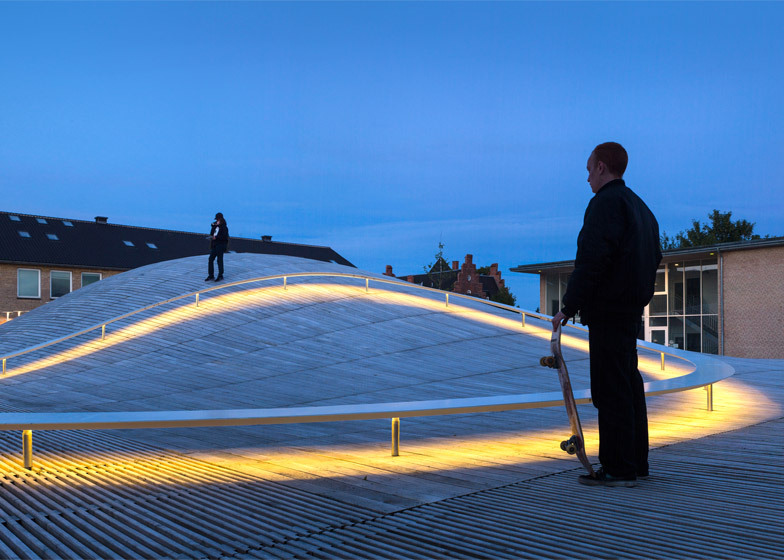 They decided to follow the same principle, designing a partially sunken building with an accessible roof surface. 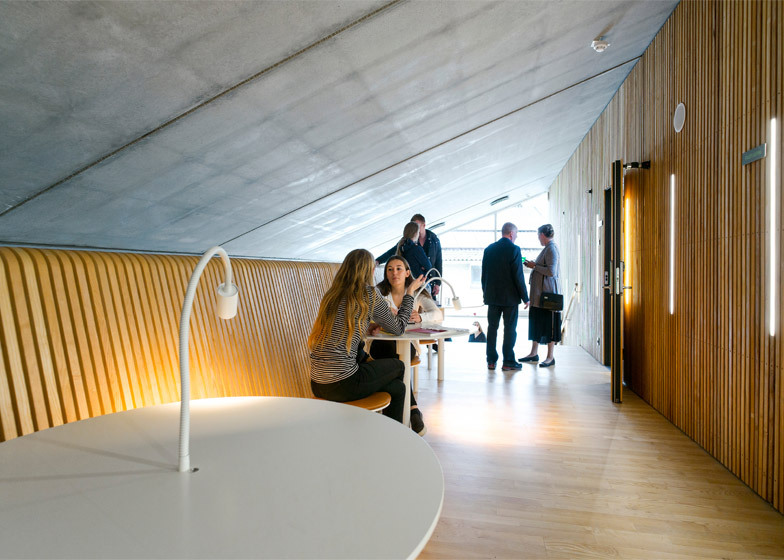 According to BIG, the aim was to "provide students with generous spaces for social and creative unfolding, while increasing the capacity of the school in response to its growing popularity". The new structure comprises two storeys. 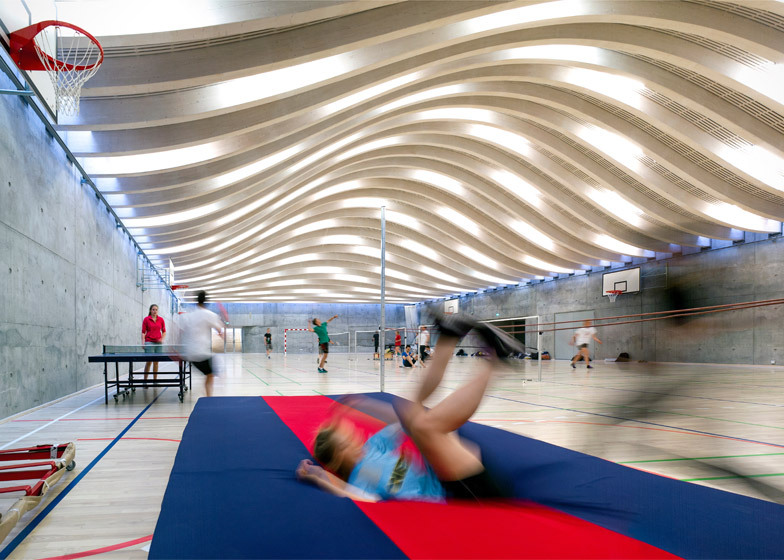 One is entirely submerged, while the other angles from the ground in front of the sports hall's roof. 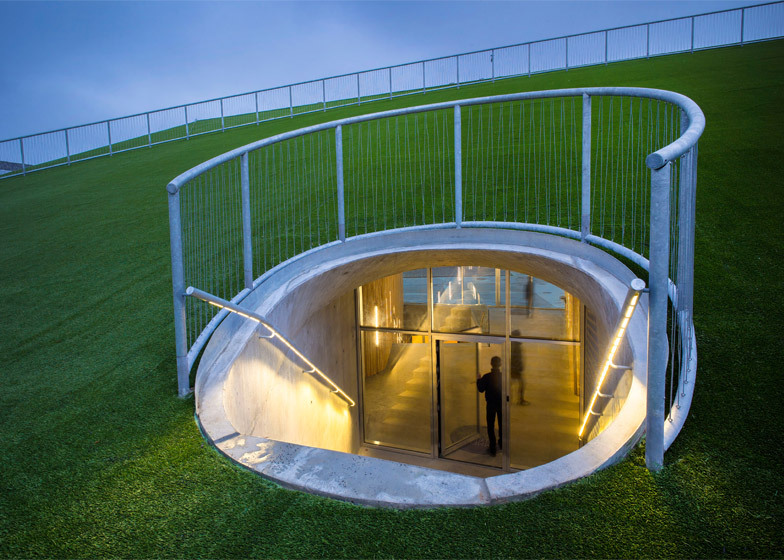 Its roof provides an extension to the adjacent football pitch, extending its grassy surface up to create a manmade hillside where spectators can sit to watch the games. 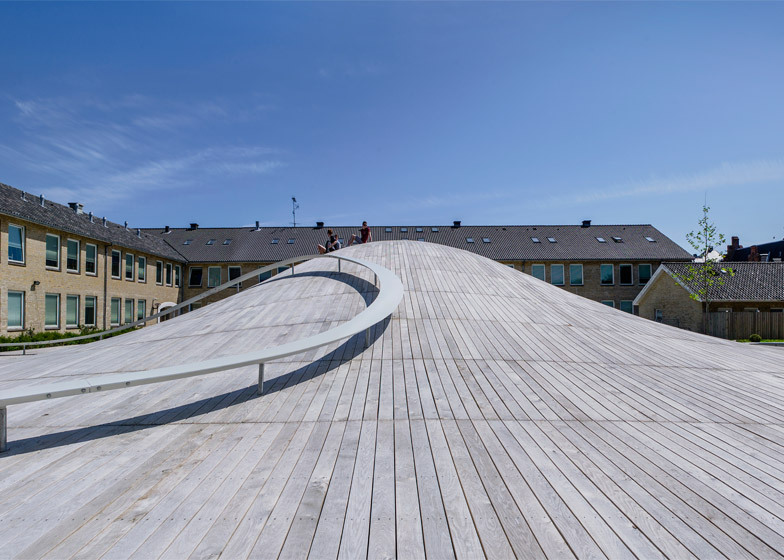 A subterranean network of corridors links the building to the rest of the school. 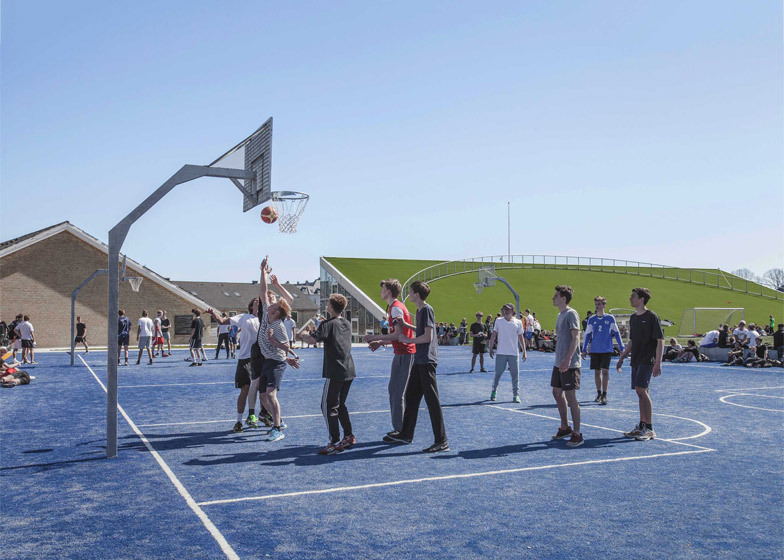 "This new arts building seeks to connect the sports areas with the gymnasium's existing educational facilities in one continuous flow," BIG said in a statement. 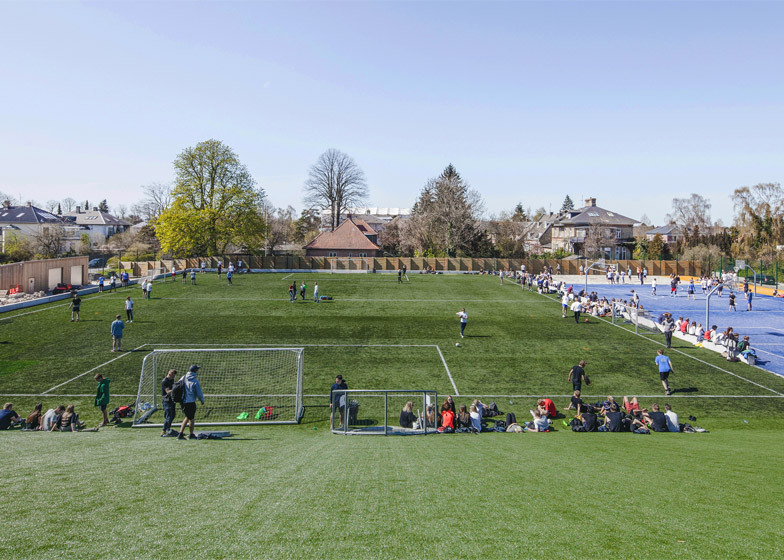 "By placing parts of the new building beneath the football fields, the students are able to walk through the sunken sports hall at the centre of the school's courtyard, to the classrooms, cafeteria, and out to the main entrance at street level," it said. 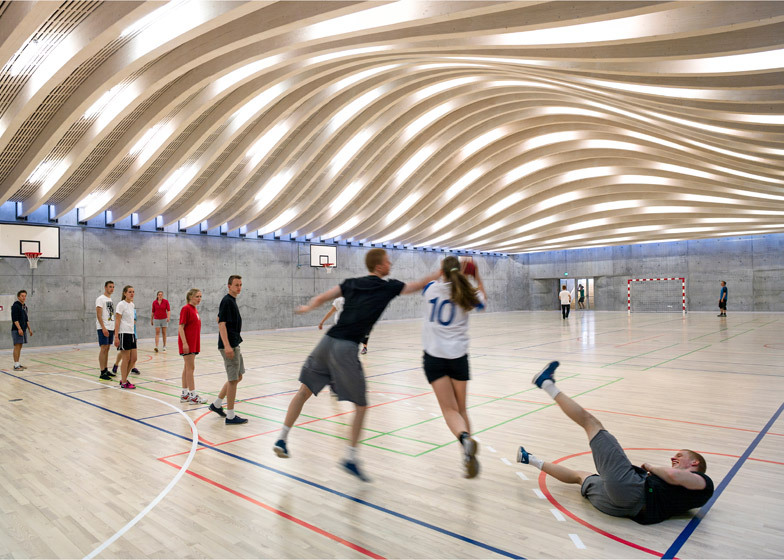 Construction materials and finishes in the new building were designed to match the sports hall, but appear in reverse. 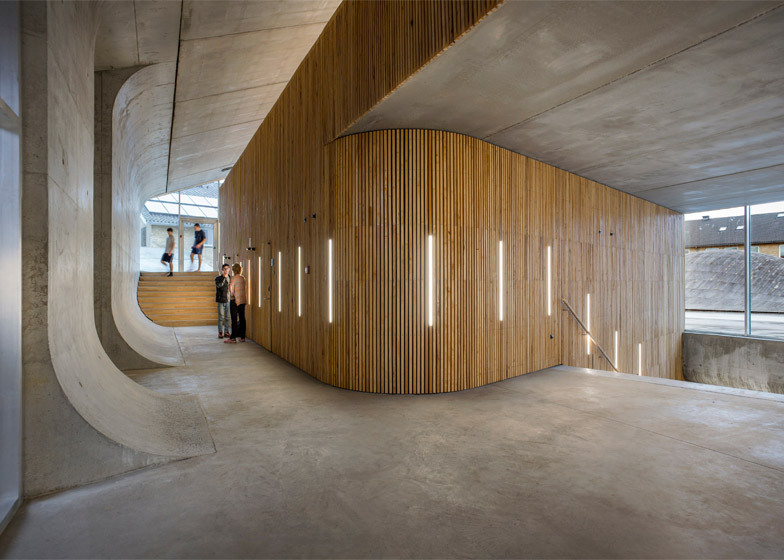 While that building features concrete walls and wooden floors and ceilings, the art school has wooden walls and concrete floorplates. 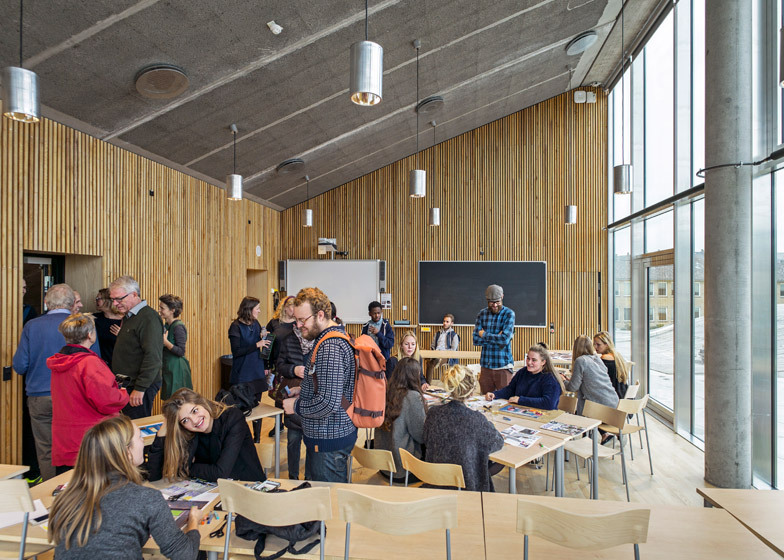 "The continuity and repetition of the materials creates a coherent visual identity for the school," added BIG. 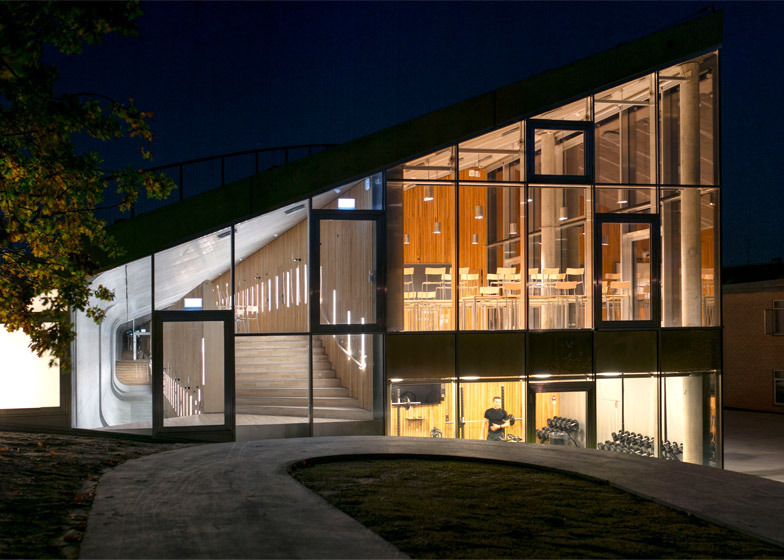 The front and only facade of the block is entirely glazed, allowing as much visibility between indoor and outdoor spaces as feasible. Several entrances are integrated into this wall, while another emerges through a hole in the roof. 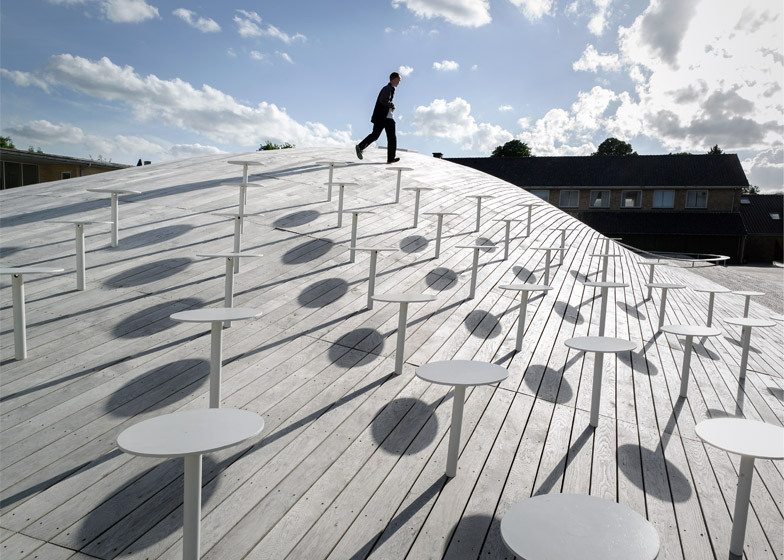 Photography is by Jens Lindhe, apart from where otherwise indicated.